Wildland fire has been an integral part of the landscape of the conterminous United States for millennia. Analysis of contemporary and pre-industrial (~ 200 - 500 yr BP) conditions, using potential natural vegetation, satellite imagery, and ecological fire regime information, shows that wildland fires burned 35 - 86 x 106 ha (megahectares) annually in the pre-industrial era, consuming 530 - 1230 teragram (Tg) of biomass. At present, in comparison, 5 - 7 Mha/yr burn, consuming 77 - 189 Tg of biomass annually. If historic fire regimes were restored to non-urban and non-agricultural lands today, 18 - 43 Mha would burn annually, consuming 285 - 602 Tg of biomass. For each era, 11 biomass (wildland and agricultural) burning emissions were estimated, and differences of similar magnitude were found. Estimates of contemporary fossil fuel emissions are also provided for comparison. Atmospheric, climatic, social, and ecological system effects from the decrease in area burned, biomass consumed, and emissions produced are discussed. KEY WORDS: air quality; biomass burning; climate change; conterminous United States; emission estimates; fire regimes; pre-industrial conditions; prescribed burning; wildland fire. Biomass burning is part of the dynamic equilibrium between biotic production and decomposition, and is the primary oxidation mechanism in most temperate zone ecosystems because of their relatively slow biological decomposition rate (Pyne 1982). The heat generated and the combustion by-products produced by fire have multiple atmospheric, climatic, social, and ecological effects. Wildland fire from lightning and anthropogenic sources has shaped, and continues to shape and influence, the North American landscape, atmosphere, climate, and human society. Since crossing the Siberian land bridge, humans have interacted with fire to modify their environment and shape the biological diversity and atmospheric conditions of the Western Hemisphere (Pyne 1995). European settlement, through land use changes and active fire management, has significantly altered wildland fire activity (Crosby 1986, Anderson 1996). Without wildland fire, many forested communities are plagued with overstocking, excessive fuel accumulation, stagnation, and inadequate reproduction, factors that encourage diseases and insects. Grasslands become stagnant and are invaded by shrubs and trees. Shrublands become decadent or impenetrable thickets. With a lack of fire, wildlife generally declines in numbers and diversity, except in shrubby grasslands (Wright and Bailey 1982). Many ecosystems that have adapted to wildland fire become increasingly unstable as succession progresses following fire. Mineral nutrients such as nitrogen and phosphorus become less available in the soil as they are taken up and stored in plant tissues, thus limiting opportunities for seedling establishment and stressing established plants. Fuels continue to accumulate, increasing the probability of fire and the intensity and severity of fires that do occur. Wildland fire has resulted in the evolution of plant adaptations that concentrate reproductive effort in the period immediately following fire (e.g., seeds of whispering bells, Emmenanthe pendulifora, germinate when exposed to nitrogen dioxide in smoke; Mlot 1997). This has made some ecosystems not simply tolerant of wildland fire, but dependent on it (Christensen 1991). Biomass-burning emissions (carbon dioxide, carbon monoxide, methane, particulate matter, nitrogen oxide, hydrocarbons, and organic and elemental carbon) affect atmospheric chemistry, and possibly regional and global climate. Several biomass combustion emissions are classified as criteria pollutants under the Clean Air Act: carbon monoxide, particulate matter, and nitrogen oxide. These criteria pollutants have been documented as factors contributing to chronic and acute human health problems. The Clean Air Act also establishes visibility standards for Class-1 areas (Sandberg et al. 1979). Particulate matter < 2.5 micron, organic carbon, hydrocarbons, and inorganic carbon emissions scatter light and contribute to haze, which degrades visibility, affects scenic aesthetics, and impacts tourism economies. Carbon dioxide, carbon monoxide, and methane are greenhouse gasses that have the potential to trap radiant heat, but particulate matter acts to reflect solar radiation, which may cool surface temperatures (Crutzen and Goldammer 1993). The objectives of this study were to estimate pre-industrial (just prior to significant European settlement in North America, ~ 200-500 yr BP) and contemporary landscape biomass burning (wildland and agriculture); to estimate the amount of wildland fire activity that might be expected if today's lands not classified as urban or agricultural were restored to historic fire regimes; to compare pre-industrial and contemporary biomass burning and fossil fuel combustion emissions; and to discuss some of the possible ecological, atmospheric, climatic, and social effects that may have resulted. Biomass-burning activity and fossil fuel emissions can be either inventoried or estimated from related data. Information on contemporary wildland fire activity was obtained from inventories of national wildland and prescribed fires. Contemporary agricultural burning activity and fossil fuel emission data were obtained from EPA reports. Pre-industrial and expected wildland fire activity were estimated from related data, using national land classification data, remote-sensing technology, and known ecological fire return intervals. Expected wildland fire activity was the amount of wildland fire activity expected today if historic fire regimes were restored to non-urban and non-agricultural lands. The methods used are similar to those used by Taylor and Sherman (1996). Pre-industrial, contemporary, and expected maximum and minimum, rather than mean or median, estimates of the annual area burned, biomass consumed, and emissions produced were calculated and presented in order to address the natural range of variability in fire return intervals caused by climate variation and other influences. Contemporary wildland activity estimates were obtained from three inventories. Annual wildfire reports between 1987 and 1996 were used to determine current variation in wildfire activity (NIFC 1997). This period includes both the active fire seasons of 1988, 1994, and 1996 and the inactive seasons of 1989, 1993, and 1995. The 1996 and 1993 fire seasons provide the maximum and minimum values in the analysis. 1978 and 1989 national inventories of prescribed burning are the source of prescribed silvicultural burning data (Sandberg et al. 1979, Ward et al. 1993). The 1978 inventory defines the minimum, and the 1989 inventory the maximum, prescribed-fire values. The 1978 inventory was incomplete, in that it excluded states with < 405 ha burned per year and those from which data were not available. The 1989 inventory was the last systematic, national assessment of prescribed-fire activity. Two assessments of contemporary rangeland and cropland burning (McAdams et al. 1983, Craig 1988) were synthesized by the EPA (1992) and are used in this study to represent contemporary landscape agricultural burning. Values for maximum and minimum area burned that were reported in the EPA synthesis were used. There are recognized limitations to these inventory data. Even though there has been a national wildfire-reporting system for >10 yr, individual wildfire reports are frequently incomplete and inaccurate. There is no national prescribed-fire reporting system, and some states forbid the collection of agricultural burning statistics. Biomass burning associated with forest or agricultural commodity processing is not included. Although limited, these sources are probably as good an estimate of present landscape biomass-burning activity as is currently available. The Federal Wildland Fire Policy and Program Review recognized the limitations of present fire statistics and instructed federal agencies to work with their state, tribal, and local partners to improve both the wild- and prescribed-fire statistics (USDA and USDI 1996). When the new statistics become available, further refinement will be possible. Pre-industrial wildland-fire activity estimates were obtained from potential natural vegetation patterns and fire return interval information. Kuchler (1964) was used to estimate pre-industrial vegetation patterns of the conterminous United States because it represents vegetation as it would exist if European influences were removed, it reveals the ecological potential of all biotypes, it acknowledges wildland fire as a landscape factor in many of the physiognomic types, it covers the complete area of interest, and most of the 116 physiognomic types can be easily defined by fire return intervals found in the literature. Estimates of pre-industrial annual area burned were calculated by dividing the area of each physiognomic type by its respective fire return interval (Table 1). Because fire return intervals in the literature are derived mostly from dendrochronology, lake sediment and pollen analysis, and journals of frontier explorers, the pre-industrial period is limited to the recent past before significant European influences (~ 200 - 500 yr BP). The maximum and minimum values for fire return intervals reported in the literature were used to estimate the natural range of variability for each physiognomic type: the maximum annual area burned (physiognomic type area / minimum fire return interval) and the minimum annual area burned (physiognomic type area / maximum fire return interval). TABLE 1. Ranges (minimum and maximum) in estimates of annual burn area in the conterminous United States, by individual Kuchler physiognomic type, for the pre-industrial era and as expected for the contemporary era if historic fire return intervals (FRI) were restored to contemporary non-urban and non-agricultural lands. a References: (1) Agee 1993; (2) Christensen 1978; (3) Heinselman 1978; (4) Wright 1988; (5) Wright and Bailey 1982; (6) Ewel 1994; (7) Ash et al. 1983; (8) Fisher 1995; (9) Wade et al. 1980; and (10) Kucera 1978.
b Details of the National Fire Danger Rating System (NFDRS) models are provided in Tables 2 and 3. Estimates of the amount of wildland fire expected if historic fire regimes were restored to contemporary lands not classified as urban or agricultural were obtained from present vegetation patterns and fire return interval information identical to that for pre-industrial estimates. Using spatial analysis, Loveland and Hutcheson (1995) estimated the contemporary wildlands capable of supporting historic wildland fire regimes by subtracting agricultural and urban lands identified with the 1990 land cover database (Loveland et al. 1991) from each Kuchler physiognomic type. Dividing the results from Loveland and Hutchenson (1995) by the appropriate maximum and minimum estimates of fire return interval yielded the amount of wildland fire expected if historic fire regimes were restored to non-urban and non-agricultural land. Loveland and Hutcheson (1995: 471) regard this as a coarse assessment of the remaining wildlands: "It must be understood that a low percentage of agricultural or urban lands in a region does not imply that the landscape exists in a pristine natural state. In some cases, the `natural' vegetation may be altered substantially by local land-use practices such as grazing and logging or changed by the introduction or invasion of non-native vegetation." Although these estimates include significant areas where land use has altered historic fire regimes, reversal of current land use and restoration to historic fire regimes in these areas, unlike urbanized and cultivated areas, is possible (Ferry et al. 1995). These estimates can be considered both as an estimate of potential wildland fire activity and as a possible target for future fire regime restoration. However, any future fire regime will be determined by the complex interaction of social, political, and economic factors and present vegetation composition, and probably will be significantly less than this estimate. Annual biomass consumption and emissions estimates for carbon dioxide, carbon monoxide, methane, nonmethane hydrocarbon, volatile organic compounds, nitric oxide, total particulate matter, 10-micron particulate matter, 2.5-micron articulate matter, organic carbon, and elemental carbon were calculated from assessments of typical amounts of forest biomass per unit area and the proportion consumed in a typical wildland fire for each physiognomic type. The Grand Canyon Visibility Transport Commission Fire Emissions Project model was used to calculate biomass consumption and emissions in this study (Lahm 1994). National Fire Danger Rating System (NFDRS) fuel models (Deeming et al. 1977, Burgan 1988) were used for the typical biomass fuel loadings (Table 2). Each of the 20 NFDRS fuel models characterizes the fuel loading by fuel type (fine, small, large, live, and duff) and fuel consumed (Table 3). The appropriate NFDRS model for both the maximum and minimum fire return interval of each physiognomic type was determined by comparing model characteristics with general fuel conditions present under maximum and minimum return intervals. Physiognomic types with significant differences in maximum and minimum fire return interval were best represented by a separate maximum and minimum fire return interval fuel model (Table 1). For example, maximum and minimum fire return intervals in the redwood type are 300 and 33 yr, respectively (Agee 1993): fuel model G (fuel load of 61Mg/ha) best represented a fuel accumulation of 300 yr and fuel model H (fuel load of 21Mg/ha) best represented a 33-yr fuel accumulation. Annual biomass combustion and emissions estimates were calculated by multiplying the maximum and minimum annual area burned for each physiognomic type by the emission factor (Table 4), biomass consumption, and typical NFDRS fuel model fuel load (Burgan 1988). Although the NFDRS is designed to address fuel complexes across the conterminous United States, it is limited because it only addresses surface wildland fire. At this time, crown fire biomass consumption, fire behavior, and emission production cannot be accurately modeled (Darold Ward, personal communication). This limitation probably underestimates biomass consumption and emissions, because crown fires historically were, and still are, common in many forests with infrequent fires. This error is common in both pre-industrial and contemporary estimates; hence, relationships between each estimate are less affected by the error than are the estimates themselves. Another limitation is that the NFDRS assumes natural fuel loads. The fire exclusion policy over the past 70 yr has caused unnatural fuel loads to accumulate far beyond historic levels in many frequent-fire regime ecosystems (Sampson et al. 1995). The NFDRS fuel models used for maximum and minimum levels for present wildfire activity were chosen to adjust for this limitation. EPA (1996a, 1997) emission trend and greenhouse gas emission inventories provided comparative data for fossil fuel carbon dioxide, carbon monoxide, volatile organic compounds, nitric oxide, and 10-micron particulate matter. TABLE 2. National Fire Danger Rating System (NFDRS) fuel model descriptions and total fuel loadings. Clearcut conifer slash: total loading > 56030 kg/ha for materials < 15.25 cm diam. Clearcuts and heavily thinned conifer stands: loading < 56030 kg/ha for material <15.25 cm diam. TABLE 3. Proportion of total fuel consumption (TFC), proportion of the fuel consumed by flaming combustion (FC) and/or smoldering combustion (SC), and the Table 4 emission factor (EF) used for each National Fire Danger Rating System (NFDRS) model (Lahm 1994). TABLE 4. Emission factors (EF), in grams of emissions produced per kilogram of fuel consumed, for carbon dioxide (CO2), carbon monoxide (CO), methane (CH4), 2.5-micron particulate matter (PM2.5), 10-micron particulate matter (PM10), total particulate matter (PM), nonmethane hydrocarbon (NMHC), volatile organic compounds (VOC), nitric oxide (NOX), organic carbon (OC), and elemental carbon (EC). Data are from Ward and Hardy (1991). There are recognized limitations in the base data (e.g., Kuchler mapping scale 1:3,168,000) and in the models and assumptions used in this study (i.e., assumptions based on broad, physiognomic fire rotation intervals and average NFDRS fuel loads and emission factors). Because of these limitations, this assessment should be considered a first approximation. Although there are many conceptual and empirical problems inherent in producing such estimates, this exercise is essential in order to: (1) identify a range of potential contemporary, pre-industrial, and expected values of biomass burning; (2) provide insight into the magnitude of change that has occurred in wildland fire; (3) provide a forum for discussing what effect this change may have had on atmospheric, climatic, social, and ecological systems, and what may be expected in the future; (4) set up a framework for future analysis; and (5) stimulate additional research and debate. In the conterminous United States, contemporary wildland, prescribed, and agriculture biomass fires burn 0.4 - 2.2, 1.2 - 2.0, and 2.9 - 3.2 Mha/yr, respectively, consuming 9 - 59, 14 - 72, and 1 - 5 Tg/yr of biomass, respectively. In the pre-industrial era, 34 - 86 Mha/yr burned, consuming 530 - 1228 Tg/yr of biomass. If historic fire regimes were restored to non-urban and non-agricultural lands, 18 - 43 Mha/yr would burn, consuming 285 - 601 Tg/yr of biomass (Fig.1). FIG. 1. Estimated annual pre-industrial, expected contemporary, and contemporary area (Mha) and biomass consumed (Tg x102) for the conterminous United States. The range of pre-industrial, contemporary, and expected emission estimates for carbon dioxide, carbon monoxide, methane, nonmethane hydrocarbon, volatile organic compounds, nitric oxide, total particulate matter, 10-micron particulate matter, 2.5-micron particulate matter, organic carbon, and elemental carbon emissions can be found in Fig. 2. Fig. 2 compares these emission estimates with 1995 estimates of carbon dioxide, carbon monoxide, volatile organic compounds, and 10-micron particulate matter fossil fuel emission. FIG. 2. Annual pre-industrial, expected contemporary, and contemporary emission estimates from biomass burning in the conterminous United States for: carbon dioxide (Tg x 102), carbon monoxide (Tg), methane (Tg x 10-1), nonmethane hydrocarbon (Tg x 10-1), volatile organic compounds (Tg x 10-1), nitric oxide (Tg x 10-1), total particulate matter (Tg x 10-1),10- micron particulate matter (Tg x 10-1), 2.5-micron particulate matter (Tg x 10-1), organic carbon (Tg x 10-1), and elemental carbon (Tg x 10-2). These are compared with 1995 fossil fuel emission estimates for carbon dioxide, carbon monoxide, volatile organic compounds, nitric oxide, and 10-micron particulate matter. These results suggest that there has been a significant decrease in wildland fire since the pre-industrial era. About 10 times more landscape was burned, 8 times more biomass was consumed, and 7 times more emissions were produced in the pre-industrial conterminous United States than at present. Greenland ice sheet (Taylor et al. 1996), lake sediment (Clark and Royall 1994), and Canadian ecological (Taylor and Sherman 1996) studies have also detected differences of similar magnitude between pre-industrial and contemporary biomass-burning activity. This decrease in wildland fire across the conterminous United States may have contributed to significant atmospheric, climatic, social, and ecological system effects. Since the pre-industrial era, there has been a roughly sevenfold decline in biomass-burning criteria pollutants (carbon monoxide, particulate matter, nitrogen oxide and hydrocarbons) and light-scattering and visibility-reducing particles (2.5-micron particulate matter, organic carbon, and elemental carbon) in the atmosphere. Today, the EPA (1996b) estimates that there are 15,000 premature deaths each year from 2.5-micron particulate matter and ozone. This significant reduction in emissions had the potential to improve human health and scenic visibility. Because fossil fuel emissions were increasing (Ghan and Penner 1992) during much of the period in which biomass-burning emissions were declining, the effects of decreasing wildland fire activity on atmospheric and air quality were not well documented. The EPA (1997) reported 1995 U.S. emissions of carbon monoxide, volatile organic compounds, nitrogen oxide, and 10-micron particulate matter of 78, 20, 2, and 2 Tg, respectively. Pre-industrial biomass-burning emissions of these compounds were 27 - 54, 16 - 33, 2 - 4, and 4 - 7 Tg/yr, respectively. Thus, the net effect of biomass-burning emission reductions was to partially mitigate atmospheric effects of the fossil fuel emission increases, and not to significantly improve the human environment. Unfortunately, although atmospheric effects of increased fossil fuel burning were mitigated by reduced biomass burning, the unique ecological properties of biomass burning (simultaneous soil heating, nutrient cycling, and altering the community structure) were lost to the biosphere. The climatic effects of reduced biomass-burning emissions and the effects of future climate changes on wildland fire are still debatable. 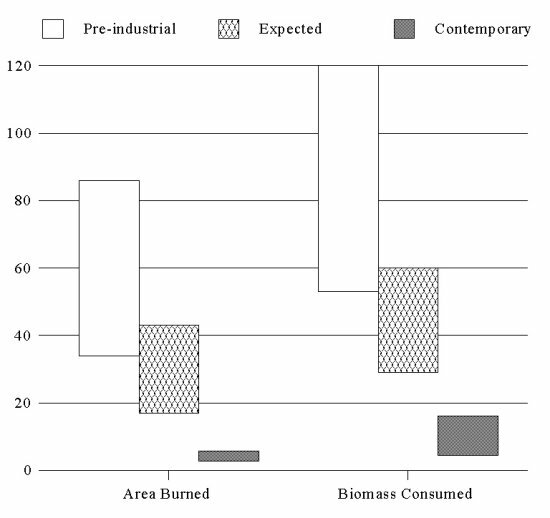 Pre-industrial conterminous U.S. biomass consumed by burning was 530 - 1228 Tg/yr. This relates to 50 -100% of the 1300 Tg/yr of global tropical forest biomass burned today (Levine 1994). Pre-industrial and contemporary carbon dioxide emissions from biomass burning are 890 - 2100 and 33 - 189 Tg/yr, respectively. Annual fossil fuel carbon dioxide emission in 1995 was 4900 Tg. In the short term, wildland fires emit significant gross amounts of greenhouse gases (carbon dioxide, carbon monoxide, and methane). In functional fire-adapted ecosystems, most of the carbon lost by burning is recovered as new growth, and the net effect on atmospheric greenhouse gas emission is negligible (Crutzen and Goldammer 1993). However, wildland fires may be a significant long-term sink for atmospheric carbon dioxide. Incomplete combustion is common in wildland fires, and a significant amount of stable elemental carbon (i.e., charcoal) is created. Charcoal production during pyrolysis, on an ash-free dry mass basis, is 18 - 24, 17 - 23, 36 - 38, 20 - 33, 19 - 27, and 25 - 46% for grass, wood, duff, foliage, small stems, and bark, respectively. This charcoal can remain inert in soils and aquatic sediments for centuries (Seiler and Crutzen 1980, Clark and Royall 1994). Particulate matter from biomass burning has been documented to reduce daytime surface temperatures (Lenoble 1991). Penner et al. (1992) estimated that smoke particles from contemporary biomass burning may add up globally to a cooling effect as large as 2 W/m2. In the conterminous United States, pre-industrial biomass-burning emissions of 2.5-micron particulates were ~ eightfold higher than today (5 - 11 vs. 0.3 - 2 Tg/yr). Clark et al. (1996) identified a regional shift in biomass burning from the Midwest to the Northeast, consistent with this study, and suggested that this change in atmospheric aerosol particles may have affected regional climate. Many other papers have discussed the role of atmospheric aerosol particles, including smoke from wildland fires, in changing the global radiation budget through direct backscattering effects of aerosols, as well as through their indirect effects on cloud albedo, via their role as cloud condensation nuclei. These studies indicate that climate-forcing by aerosols may be equivalent in magnitude, but opposite to that of greenhouse gases (Wigley 1989, Charlson et al. 1991, 1992, Robock 1991a, b, Packham and Tapper 1996). Packham and Tapper (1996) note that effects of atmospheric aerosol particles have not been incorporated into any of the general circulation models in use today. A changing climate may also affect future biomass-burning patterns in the United States. One attempt to forecast the effect of a doubling of atmospheric carbon dioxide on wildland fire activity, using the Goddard Institute for Space Studies General Circulation Model, found that the annual mean number of lightning fires in the United States increased by 44%, whereas the area burned increased by 78% (Price and Rind 1994). Today, 2 -4 x 106 ha/yr are burned in wildland and prescribed silvicultural fires. If historic fire regimes were returned to non-urban and non-agricultural lands, 18 -43 x 106 ha/yr would burn. This difference is an indicator of wildland fire potential. The social effects of wildland fire are well documented every summer, unfortunately in the form of firefighter and public deaths, human property losses, and suppression costs. Excluding fire from many ecosystems has increased wildland fuel loads beyond natural levels, thereby increasing both the intensity and severity of wildfires (NCWF 1994). If wildland fuel loads are not reduced to pre-industrial levels, there will be unfavorable economic and social impacts. Intense, severe wildfires with high property loss (e.g., 1987 northern California, 1988 Yellowstone, 1991 Oakland Hills, 1993 southern California, 1994 western fire complex, 1996 Lake Tahoe) will continue. The human and economic costs of wildfire suppression will continue to increase. In 1994, wildfire suppression led to 33 deaths and costs exceeding $1 billion. Suppression technology, so effective in the 1950s - 1970s, is beginning to fail as wildfire intensities continue to increase and high-intensity wildfires become more frequent, due to continued fuel accumulation (NCWF 1994, USDA and USDI 1996). Fuel loads can only be reduced and maintained if the rate of carbon sequestration is decreased (i.e., by urbanization and herbicide treatment), pyrolytic decomposition is converted to biological decomposition (i.e., through agriculture and livestock grazing), fuels are physically removed (i.e., through timber harvest and biomass utilization), and/or the areas are burned at near pre-industrial fire return intervals (i.e., with prescribed fire). Unfortunately, only the restoration of pre-industrial fire regimes is likely to sustain frequent-fire regime ecosystems. The difference between contemporary wildland fire activity and that expected if historic fire regimes were restored to non-urban and non-agricultural lands (2 - 4 vs. 18 - 43 x 10 Mha/yr) is also a measure of the ecosystem perturbation that has occurred. The ecological effects of wildland fire exclusion have been well documented, especially in the western United States (Clark and Sampson 1995, Sampson et al. 1995). Ferry et al. (1995) identified five ecosystems, totaling >160 Mha, that are undergoing a change in species composition, species diversity, and/or relative abundance due to altered fire regimes. Fire exclusion has been identified as a major threat to many ecosystems: whitebark pine (Kendall 1995), oak savanna (Henderson and Epstein 1995), ponderosa pine (Mutch et al. 1992), longleaf pine (Streng et al. 1993), pitch pine (Heusser 1979), aspen (Bartos et al. 1991), tallgrass prairie (Collins and Wallace 1990), etc. Hessl and Spackman (1995) found that, of the146 threatened, endangered, and rare plant species found in the conterminous United States for which there is conclusive information on fire effects, 135 species benefit from wildland fire or are found in fire-adapted ecosystems. Restoration of ecological processes is the key to promoting ecosystem stability and preserving biological integrity (Samson and Knopf 1993). Use of prescribed fire to intentionally burn wildland biomass has been successful in restoring wildland fire regimes to many fire-adapted ecosystems (Wright and Bailey 1982). At present, 60 - 90% of the total area burned is by prescribed wildland or agricultural burning; it has been proposed that additional prescribed wildland fire is needed (USDA and USDI 1996). The results also indicate that, to restore historic fire regimes on non-urban and non-agricultural lands, 3 - 6 times more area must be burned, consuming 4 - 8 times more biomass (Fig. 1) and producing up to 6 - 9 times more emissions than at present (Fig. 2). Over the past century, wildland biomass has accumulated well beyond historic levels, through continued carbon sequestration due to fire exclusion policies (Clark and Sampson 1995, USDA and USDI 1996). Average per-unit emissions will probably be greater for the remaining wildlands than during the pre-industrial era, because wildland biomass has not only accumulated well beyond historic levels, but also a greater proportion of the remaining wildlands is in forest and shrubland, which contain more biomass per unit area (Burgan 1988) and have poorer combustion efficiency (Sandberg et al. 1979). Despite its ecological benefits, wildland fire restoration has significant social, political, and economic implications. No other type of fuel reduction (e.g., grazing, timber harvest, biomass utilization, etc.) can duplicate the unique ecological effects of wildland fire (simultaneous soil heating, nutrient cycling, and altering the community structure). Without a proportional reduction in agricultural or fossil fuel emissions (which is unlikely), increased human health risks and atmospheric impacts can be expected if wildland fire is restored as an ecological process. Wildland fire has been, and will continue to be, a significant process shaping the landscape of the conterminous United States, either in the form of unwanted wildfires or restorative, prescribed fires. Historically, humans have interacted with the process, either reactively or proactively, and will continue to do so. Future stewardship decisions about whether to exclude or restore wildland fire must include both short- and long-term social, ecological, atmospheric, and climatic effects, as well as the regional consequences of any new wildland fire regime. New policies of biomass burning that integrate all effects are needed, and are best developed at the local or regional level, where land uses, ecological responses, and atmospheric and social effects can best be assessed (Crutzen and Goldammer 1993). I greatly appreciate the AVHRR and Kuchler land classification data and geographical information system assistance provided by T. R. Loveland of the U.S. Geological Service and J. Kinnee of the U.S. Environmental Protection Agency. Agee, J. K. 1993. Fire ecology of the west forests. Island Press, Washington, D.C., USA. Anderson, M. K. 1996. Tending the wilderness. Restoration and Management Notes 14(2):154-165. Ash, A. N., C. B. McDonald, E. S. Kane, and C. A. Pories. 1983. Natural and modified pocosins: literature synthesis and management options. U.S. Department of the Interior, USDI FWS/OBS-83/04. Bartos, D. L., W. F. Mueggler, and R. B. Campbell, Jr. 1991. Regeneration of aspen by suckering on burned sites in western Wyoming. U.S.Department of Agriculture, Forest Service Research Paper INT-448. Burgan, R. E. 1988. 1988 revisions to the 1978 nation fire-danger rating system. U.S. Department of Agriculture, Forest Service Research Paper SE-273. Charlson, R. J., J. Landner, H. Rodhe, C. B. Leovy, and S. G. Warren. 1991. Pertubation of the northern hemisphere radiative balance by backscattering from anthropogenic sulfate aerosols. Tellus 43:152-163. Charlson, R. J., S. E. Schwartz, J. M. Hales, R. D. Cess, J. A. Coakley Jr., J. E. Hansen, and D. J. Hofmann. 1992. Climate forcing by anthropogenic aerosols. Science 255:423-430. Christensen, N. L. 1978. Fire regimes in Southeastern ecosystems. Pages 112-136 in U.S. Department of Agriculture, Forest Service General Technical Report WO-26. _______ . 1991. Variable fire regimes on complex landscapes: ecological consequences, policy implications, and management strategies. Pages ix-xiii in S.C. Nodvin and T. A. Waldrop, editors. Fire and environment: ecological and cultural perspecitives. U.S. Department of Agriculture, Forest Service General Technical Report SE-69. Clark, J. S., and P. R. Royall. 1994. Pre-industrial particulate emissions and carbon sequestration from biomass burning in North America. Biogeochemistry 23:35-51. Clark, J. S., B. J. Stocks, and P. J. H. Richard. 1996. Climate implications of biomass burning since the 19th century in eastern North America. Global Change Biology 2:433-442. Clark, L. R., and R. N. Sampson. 1995. Fire ecosystem health in the Inland West: a science and policy reader. American Forests, Washington, D.C., USA. Collins, S. L., and L. L. Wallace, editors. 1990. Fire in North American tallgrass prairies. University of Oklahoma Press, Norman, Oklahoma, USA. Craig, C. 1988. Agriculture burning around the nation. Interoffice memo, Oregon Department of Agriculture, Salem, Oregon, USA. Crosby, A. W. 1986. Ecological imperialism. Cambridge University Press, New York, New York, USA. Crutzen, P. J., and J. G. Goldammer, editors. 1993. Fire in the environment: the ecological, atmospheric, and climatic importance of vegetation fires. John Wiley, New York, New York, USA. Deeming, J. E., R. E. Burgan, and J. D. Cohen. 1977. The national fire-danger ration system - 1978. U.S. Department of Agriculture, Forest Service General Technical Report INT-39. EPA (U.S. Environmental Protection Agency). 1992. Prescribed burning background document and technical information document for best available control measures. U.S. EPA, Office of Air Quality Planning and Standards, Research Triangle Park, North Carolina, USA. _______ . 1996a. Inventory of U.S. greenhouse gas emissions and sinks, 1990-1994. Publication 230R96006. U.S. Environmental Protection Agency, Office of Policy, Planning, and Evaluation, Washington, D.C., USA. _______ . 1997. 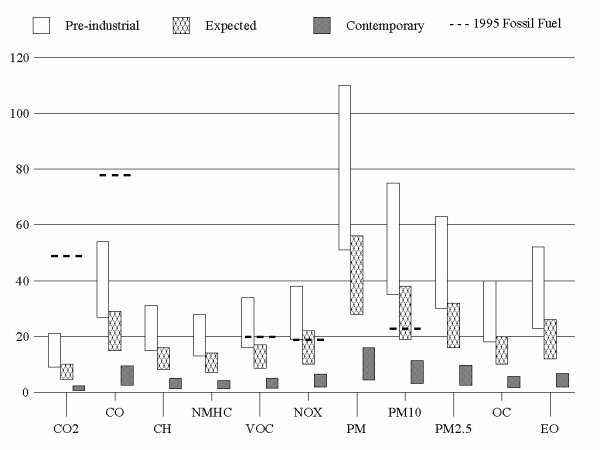 National air quality and emissions trends report, 1995. EPA, Office of Air Quality Planning and Standards, Triangle Park, North Carolina, USA. Ewel, K. C. 1994. Fire in cypress swamps in the Southeastern United States. Pages 111-116 in S.I. Cerulean and R. T. Engstrom, editors. Fire in wetlands: a management perspective. Proceedings of the19th Tall Timbers Conference, Tallahassee, Florida, USA. Ferry, G. W., R. G. Clark, R. E. Montgomery, R. W. Mutch, W. P. Leenhouts, and G. Thomas Zimmerman. 1995. Altered fire regimes within fire-adapted ecosystems. Pages 222-224 in E.T. LaRoe, G. S. Farris, C. E. Puckett, P. D. Doran, and M. J. Mac, editors. Our living resources. U.S. Department of the Interior, National Biological Service, Washington, D.C., USA. Ghan, S. J., and J. E. Penner. 1992. Smoke, effect on climate. Encyclopedia of Earth System Science 4:191-198. Henderson, R. A., and E. J. Epstein. 1995. Oak savannas in Wisconsin. Pages 230-232 in E.T. LaRoe, G. S. Farris, C. E. Puckett, P. D. Doran, and M. J. Mac, editors. Our living resources. U.S. Department of the Interior, National Biological Service, Washington, D.C., USA. Hessl, A., and S. Spackman. 1995. Effects of fire on threatened and endangered plants: an annotated bibliography. U.S. Department of Interior, National Biological Service, Information and Technology Report 2. Heinselman, M. L. 1978. Fire intensity and frequency as factors in the distribution and structure of northern ecosystems. Pages 7-57 in U.S. Department of Agriculture, Forest Service General Technical Report WO-26. Heusser, C. 1979. Vegetational history of the pine barrens. Pages 215-312 in R.T. Forman, editor. Pine Barrens: ecosystem and landscape. Academic, New York, New York, USA. Kendall, K. C. 1995. Whitebark pine: an ecosystem in peril. Pages 228-230 in E.T. LaRoe, G. S. Farris, C. E. Puckett, P. D. Doran, and M. J. Mac, editors. Our living resources. U.S. Department of the Interior, National Biological Service, Washington, D.C., USA. Kucera, C. A. 1978. Grasslands and fire. Pages 90-111 in U.S. Department of Agriculture, Forest Service General Technical Report WO-26. Kuchler, A. W. 1964. Potential natural vegetation of the conterminous United States. American Geographical Society, New York, New York, USA. Levine, J. S. 1994. Biomass burning and the production of greenhouse gases. Pages 139-160 in R.G. Zapp, editor. Climate biosphere interaction: biogenic emissions and environmental effects of climate change. John Wiley, New York, New York, USA. Lenoble, J. 1991. The particulate matter from biomass burning: a tutorial and critical review of its radiative impact. Pages 381-386 in J.S. Levine, editor. Global biomass burning: atmospheric, climate, and biospheric implications. Massachusetts Institute of Technology Press, Cambridge, Massachusetts, USA. Loveland. T. R., and H. L. Hutcheson. 1995. Monitoring changes in landscapes from satellite imagery. Pages 468-473 in E.T. LaRoe, G. S. Farris, C. E. Puckett, P. D. Doran, and M. J. Mac, editors. Our living resources. U.S. Department of the Interior, National Biological Service, Washington, D.C., USA. Loveland, T. R., J. W. Merchant, D. O. Ohlen, and J. F. Brown. 1991. Development of a land-cover characteristics data-base for the conterminous U.S. Photogrammetic Engineering and Remote Sensing 57 (11):1453-1463. Mlot, C. 1997. Where there's smoke, there's germination. Science News 151:334. Mutch, R. W., S. F. Arno, J. K. Brown, C. E. Carlson, R. D. Ottmar, and J. L. Peterson. 1992. Forest health in the Blue Mountains: a management strategy for fire-adapted ecosystems. U.S. Department of Agriculture, Forest Service General Technical Report PNW-GTR-310. NCWF. 1994. Report of the National Commission on Wildfire Disasters. American Forests, Washington, D.C., USA. NIFC. 1997. 1996 statistics and summary. National Interagency Fire Center, Boise, Idaho, USA. Packham, D., and N. Tapper. 1996. Climate change and biomass burning. 13th Fire and Forest Meteorology Conference, Lorne, Australia. Penner, J. E., R. E. Dickinson, and C. A. O'Neill. 1992. Effects of aerosol from biomass burning on the global radiation budget. Science 256:1432-1434. Price, C. and D. Rind. 1994. The impact of 2xCO2 climate on lightning-caused fires. Journal of Climate 7:1484-1494. _______ . 1995. World fire: the culture of fire on earth. Henry Hold, New York, New York, USA. Robock, A. 1991a. Surface cooling due to smoke from biomass burning. Pages 463-476 in J. S. Levine, editor. Global biomass burning: atmospheric, climate, and biospheric implications. Massachusetts Institute of Technology Press, Cambridge, Massachusetts, USA. _______ . 1991b. Surface cooling due to forest fire smoke. Journal of Geophysical Research 96:20869-20878. Sampson, R. N., L. R. Clark, and L. Z. Morelan. 1995. Forest ecosystem health in the inland West. Pages 53-62 in L.G. Eskew, compiler. Forest health through silviculture. Proceedings of the 1995 Natural Silviculture Workshop, 8-11 May 1995; Mescalero, New Mexico. USDA Forest Service General Technical Report RM-GTR-267, U.S. Department of Agriculture, Forest Service, Rocky Mountain Forest and Range Experiment Station, Fort Collins, Colorado, USA. Samson, F. B., and F. L. Knopf. 1993. Managing biological diversity. Wildlife Society Bulletin 21: 509-514. Sandberg, D. V., J. M. Pierovich, D. G. Fox, and E. W. Ross. 1979. Effects of fire on air: a state-of-knowledge review. USDA Forest Service General Technical Report WO-9..
Seiler, W., and P. J. Crutzen. 1980. Estimates of gross and net fluxes of carbon between the biosphere and the atmosphere from biomass burning. Climate Change 2:207-247. Streng, D. R., J. S. Glitzenstein, and W. J. Platt. 1993. Evaluating effects of season of burn in longleaf pine forests: a critical literature review and some results from an ongoing long-term study. Pages 227-264 in S.M. Hermann, editor. Proceedings of the 18th Tall Timbers Fire Ecology Conference, Tallahassee, Florida, USA. Taylor, K. C., P. A. Mayewski, M. S. Twickler, and S. I. Whitlow. 1996. Biomass burning recorded in the GISP2 ice core: a record from eastern Canada? The Holocene 6(1):1-6. Taylor, S. W., and K. L. Sherman. 1996. Biomass consumption and smoke emissions from contemporary and prehistoric wildland fire in British Columbia. FRDA Report 249, Victoria, British Columbia, Canada. USDA and USDI. 1996. Federal wildland fire management policy and program review. U.S. Department of Agriculture and U.S. Department of the Interior, Washington, D.C., USA. Wade, D., J. Ewel, and R. Hofstetter. 1980. Fire in South Florida Ecosystems. USDA Forest Service General Technical Report SE-17. Ward, D. E., and C. C. Hardy. 1991. Smoke emissions from wildland fires. Environmental Information 17:117-134. Ward, D. E., J. Peterson, and W. M. Hao. 1993. An inventory of particulate matter and air toxic emissions from prescribed fires in the USA for 1989. In Proceedings of the Air and Waste Management Association's 86th Annual Meeting and Exposition, Denver, Colorado, USA, 14-18 June 1993. Air and Waste Management Association, Pittsburg, Pennsylvania, USA. Wright, H. A. 1988. Role of fire in the management of Southwestern ecosystems. Pages 1-5 in J.S. Krammes, editor. Effects of fire management of Southwestern natural resources.USDA Forest Service General Technical Report RM-191. Wright, H. A., and A. W. Bailey. 1982. Fire ecology: United States and southern Canada. John Wiley, New York, New York, USA.